Mandel: German for "Almond", Brot = "Bread"
So literally "Almond Bread" is our name for Fractality..? then simply having revolved the 2 golden mean spirals in the heart shape into 3D, valentines day comes into a new dimension.. Note from Dan: It seems to me the above animation, and the 2 immediately below, are examples of a golden mean spiral wrap in 3D which are embedable... in the sense that they can produce an infinite recursive (3d fractal?) zoom.. note the below 2 are the equation I used to make alphabets..
Lawrence Gardner: Bloodline of the Grail.,StarFire-Annunaki, Genesis of the Grail Kings, ShewBread-Gold Powder & More.. article links. Remember, Lawrence Gardner's series of books in one way amount to a simple ad for another silver bullet medicine: shew-bread (almond bread)/manna/ ormes/spice.. Yet without USING the pure principle of how to SHAPE THE HEART WAVE INTO EMBEDDING THE REAL GRAIL... which is contained in the SHAPE of the GOLDE POWDER's nucleus... the soul loses the skill TO MAKE THE INNER GOLD / THE INNER FIRE. These conversations have interesting connections to the physics of Implosion vs Gravity notes at ../predictions I do believe gold's recursive (multiples of Golden Ratio in the Electron vs Nuclear Radii producing non-destructive recursive heterodyning ) account for the distributive across many spectra harmonic phase sorting/implosion qualities associated with Ormus..
8/99 Update from Dan on What GOLD POWDER does to Glandular Emotion... ..
you are deeply embedded now.. in the heart.. So why has the PRINCIPLE OF PERFECT NESTING OR EMBEDDING BECOME SYNONYMOUS WITH KNEADING OR BRAIDING INTO BREAD? For Example we see that the NAME of the Jesus/Magda blood line is Priori De Scion.. Which means PRIORITY OF THE BRANCH.. from scion which means branching in tree grafting... which became the word Jon.. or John.. who was a branch of Jesus blood (according to Steiner). Lineage of John meant perfect fractal path into DNA memory. Then the brain gathers the imploding spine juices into the "Almond" shaped Amygdala.. where they are squeezed until they produce the CHEMical braid which we call sweetness... by the Phi ratioed Almond.. BRAIDER..
then one original journal on FRACTALITY is named "Amygdala" which became Rollo Silver's Fractal Recursive Art.. which became his fractal calendar.. which became Spiral Calendar (by Carolan) showing fractality in time became self-organizing.. which became the templar agenda for repair of the "fabric of time" which rebraided angel blood..(Angels & The Role of Human Emotional Energy in our Galaxy. ) ...which the chief templar builder reported was at dream instructions from Magdalen..(book:"Builders of Chartres"). Templar link above is in honor of/inspired by the memory of Boudet, the brains behind Sauniere, the original conspirator of Holy Blood Holy Grail.. which is about the geometry of EMBEDDING's PERFECT GRAIL!.. "The more I read it, the more it makes sense. In heart 3D perspective animation even. 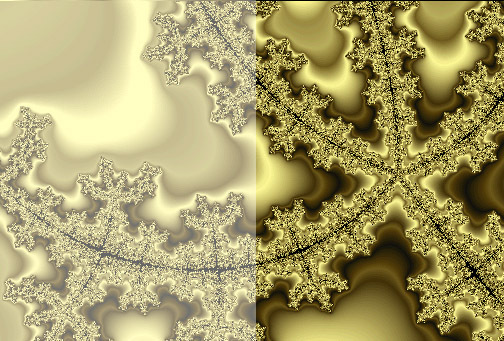 in order that her magnetic ecstatic memories could unpack out of the FRACTAL in her glands, into the land, then into the stars.. in an in-PHI-knitly FRACTAL non-destructive perfectly distributable wave form... which is the PRINCIPLE of FRACTALITY or embed-ability in general..
by announcing that GOLD BREAD (biblical manna /Hudson's ORMES /or "spice"in DUNE) is literally how the GODS became immortal..
and BREAD is a name for the principle that if the folding or needing process is in-PHI-knitly contiguous, there can be an in-PHI-knit number of laminar layers all folded non-destructively which is .. THE PRINCIPLE of how cell membranes become sustainable (by fractality call: Structural Stability and Morphogenesis.. eternal folding), and how the HEART BEAT becomes FRACTAL to create the medical proof of the end of all chronic disease..Is Embedding a Mathematical Opposite to Cancer as Wave Fractionation..
which is how water becomes laminar, braided, healed, learns to SORT and solves EVERY POLLUTION PROBLEM.. .. This gold powder, has created maximum exposed valence or electron surface for absorbtion. The cellular water takes on the outer atomic shape of gold as a packing algorhythmn, when you eat the powder. You hear a ringing in your ears. This is also true of when you eat Pat Flanagan's MicroHydrin. This is because the hydrogen becomes implosive when tucked or folded into WATER MOLECULES ARRANGED INTO A FRACTAL DODECAHEDRON. (Which is the principle bechind MicroHyrdrin). The Implosion Phenomenon: Psychological Import of Phi Harmonic Music Phi Scalar Technology & MonoAtomic Gold..
CLINICAL USE OF RECURSION HARMONICS: Is The Fractal Embedded Heart: The Enveloping Wave of Compassion? In microphone design, the principle of sonic coherence is optimized, in the CARDIOID pattern. It is the map of the area where wave fronts can meet in phase constructively.. to be gathered and felt... Cardioid means heart shaped. Clearly nature chose the shape of the heart, knowing the critical nature of aligning phases at a focal point. Is this permission to DISTRIBUTE a wave, the basis of Valentine's day, HEARTLINK's measures, fractality..and how perspectives are consumed in principle..? The Fractal Principle of Recursion Explains Love's Electricity and Gravity. Sacred Geometry, Coherent Emotion, and Planet "Taming", To know how to align long magnetic waves on the land into flowers, "grid engineering", is to teach a planet to hold atmosphere, to make coherent climate, to actually create gravity by symmetry. Our human role in this symbiosis is the electricity of our emotional field, literally braiding feeling into environment. This is a destiny for biology: to "metabolize starlight directly". the source of Gravity. It made me think, but didn't quite fit my view. Comments on your Valentine page were helpful in clarifying this matter. of the Universe is apparently accelerating. helpful, in discovering a way beyond Gravity's pull. expansion of this principle would say that EM rules Gravity. would be maximized, or optimized. (http://www.ncia.com/~rlmarker/ddtc.htm), but I am not sure exactly how. ..need to make that article more rigorous..
so as to implode capacitively, which we call gravity?? Our genepool began when annunaki gold diggers "golden ones" cloned the tak-adama (golem from orion.. )adam/ieve.. they need heart of gold to get dna that would not burn up in suns hearts.. they only thought they were after gold in the grid.. (sitchen)..
gold only occured where ley magnetics crossed into embedding/fractal.. so the real meaning of the EXISTENCE of gold in our planets veins, was the existance of the necessary magnetic inversion envelope structure to nurture self reference magnetically: which is the only real possible DEFINITION of self awareness.... here a DNA of unprecendented inward penetrance (to inhabit is have the skill to embed).. ultimately a higher leverage way not just to steer ecosystem magnetics from glands at will.. but also to steer stars.. (see angel birth.. and orionheart)..
Subject: "GOLD"(California State Mineral) and the emergence from seven Caves(Underground Civilizations). "Seven Cavern Cities of GOLD". of San Luis Valley in Colorado. Then there was "Thunder God's Gold", in Arizona's Mysterious Superstition Mountains. southward in search of a sign that would indicate that they should settle once more. was a viking, sole survivor of a sea exploration. Or a Celtic person from the Tribe of DANA. There were Seven gold masks - The Aztec people's origin was emergence from seven caves. There were SYMBOLIC "7 CAVES" Rituals sites, from Wyoming to Mexico. An Aztec treasure sign, a circle with an arrow pointing down. of Tlaloc and fertility cult activities. The tunnels and caves of Teotihuacan are located immediately to the east of the Pyramid of the Sun. language is often said to include three levels of meaning for its words or expressions: literal, syncretic and connotative. Pima, Yaqui, Tepehuan, Rara'muri (Tarahumara), Kiowas and Mayos. Institute made an archaeological survey of these ruins in 1917- 1918. The name Arizona comes from an Indian word meaning "Arizonac" or Little Spring. human and animal forms, now preserved in the monument's museum. de Coronado got off on the WRONG Trail? of one of the Seven Golden Cities of Cibola. LEARN MORE. . .There were many trails: The wind trails, Ant people's trails, Lizard people's trails, who all lived and occupied certain spaces.
. . . about the trails, one is now know as "El Camino Real" ( "The California Mission Trail"). Do you think THEY just wanted to build Missions? NO....They were looking for GOLD! hacienda just outside of Ciudad Chihuahua in the 1930's. Southern California. The trails go north into Northern California GOLD COUNTRY. known in "Lost Dutchman Mine" circles. pivotal to the story of the story - and just because his works are unique and enjoyable. Indians had done GOLD mining. Joshua Tree is also dotted with abandoned gold and other types of mines. Old Dale Rd. and the city of Twenty-nine Palms. Careful...the MIBs are from Black Eagle Mine. Klamath Mountains, and Mojave Desert. and gold-bearing veins release gold particles during the weathering process. caves housing thousands by using chemicals to melt bedrock. Papalotlan (PLACE OF BUTTERFLIES) and Tepoztlan (place of metal). ORO = Gold "X" marks the spot. * From 10,000 to as many as 150,000 Monarchs migrate to Santa Cruz, California each fall. and in the Cavern Sub-Cities. * Milkweed - the only plant a Monarch caterpillar eats. Just exactly what is a butterfly? The insect order known as "lepidoptera" is made up of butterflies and moths. * Butterflies need nectar(from plants and flowers) for energy to fly and to reproduce. being transported by the wind. They also love puddles. "Puddling" areas are found near Streams. * Some Butterflies use the Caves for "hibernation". Caverns where the butterflies overwinter in. whites, orange-tips, sulphurs and swallowtails. flooded, putting the butterflies' emergence several weeks behind schedule. that monarchs feed on are late in sprouting. dramatic deviations from normal will be seen in the high-Sierra butterflies. altitudes, some species may even skip a full year. will be carried upon its wings up to the heavens, where it will be granted. curved like ice-hooks, and to get work for these weapons seems to be their chief aim and pleasure. day and night, creep into dark caves......"